For Better - Or What? : Thinking in the Shower? Like a lot of people, I get some of my best ideas in the shower, when it isn't exactly convenient to write them down. 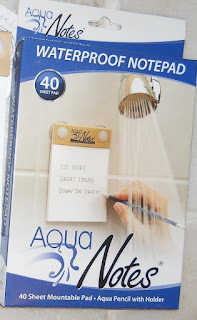 So I was quite pleased to come across Aqua Notes, a waterproof notepad that attaches to the shower wall, making it easy to jot down those flashes of inspiration before they are forgotten. If you're like me, you've already figured out that these can be used to exchange friendly messages with your significant other. In fact, the same company makes a slightly more expensive version, Aqua Love Notes. The difference is that the love notes version comes with colored pencils. Whether you use this to take notes on the next Great American Novel, or to invite your sweetie to a romantic rendezvous, I can see this item becoming an indispensable bath time accessory. That is a unique gift idea. Will have to check it out. Thanks for sharing this info.